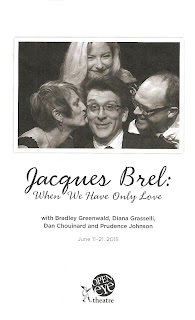 I had never heard of Belgian singer/songwriter Jacques Brel before attending Open Eye Figure Theatre's new original musical revue Jacques Brel: When We Have Only Love. But I have heard of (and been a longtime fan of) three of the four creators of the show, so this one was definitely on my must-see list. I did not recognize any of Brel's songs in the show, despite the fact that many wide-ranging singers have recorded them over the years, from John Denver to Sting. 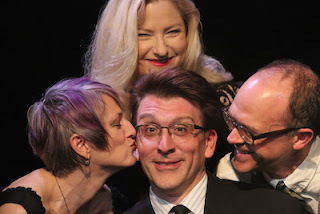 But I found the songs to be beautiful, funny, heart-breaking, and/or delightfully silly, all well-performed by this excellent cast, with an interesting and very human story tying them together. Jacques Brel: When We Have Only Love was written, arranged, directed, and designed by talented singers Bradley Greenwald, Diana Graselli, and Prudence Johnson along with master pianist Dan Chouinard (with additional musical accompaniment by Michelle Kinney on cello and Tim Sparks on guitar). The four take turns telling the story of Jacques Brel's life, from his birth in Brussels in 1929, through the war years, through his early career singing in cabarets in Paris, through international fame and success. And of course, along the way there is music. The cast performs over two dozen of Brel's songs, either the original lyrics in Brel's native Flemish-tinged French (with English translations displayed on a screen above the stage), or in English translated by various people with various degrees of success (including a couple of new translations by Bradley Greewald - yes, all that talent and he's multilingual too!). Images and photos are also displayed on the screen, helping to set the scene and tone of wherever we are in the story. The creators have done a great job weaving together songs and story to create a portrait of a man who was not always likeable, but was passionate, expressive, funny, clever, human, and a beautiful storyteller. Even though I don't speak a word of French, my favorite songs were those sung in French, because there's just something so beautiful and poetic about Brel's original lyrics and the French language. Even the best possible translation loses some of the nuances of the original language, and many of the English translations were far from best, completely changing the meaning of the song. Brel's biggest pop hit was "Seasons in the Sun," released by Terry Jacks in 1974 (which most of the audience seemed to know as it turned into a singalong). We heard both versions of the song, and trust me, the original is much different - funnier, more poignant, and less cheesy. Another favorite moment was when Bradley sang Brel's French translation of "The Impossible Dream" from Man of La Mancha, which Brel brought to Paris in 1968 and starred in. Jacques Brel's music is romantic, playful, witty, lovely, and very Parisian. It's the sound of sitting in an outdoor cafe in Paris, sipping coffee or drinking wine, listening to music waft through the sweet warm air. Or at least that's what I imagine it to be, I've only spent about a day and a half in Paris, 20 years ago (not counting the two hours last winter that my friend and I spent trying to navigate our way through the twisted and crowded streets to the highway in a rental car without GPS or a decent map, but that's a story for another day). Listening to this music makes me want to go to Paris, or at least Jacques Brel's Paris, if such a place exists anymore. Jacques Brel: When We Have Only Love is a wonderfully entertaining trip through the life and work of a prolific songwriter who was previously unknown to me. I'm glad I got to know him a little. The show continues through next weekend only and tickets are going fast, so act now if you, too, would like to go on this lovely little journey.